Biography*: John Savage, KG (–1492), was a major Cheshire landowner and supporter successively of Edward IV and Henry VII. The Savages had been established in Cheshire since his great-great-grandfather John Savage (–1386) married Margaret Danyers, heiress of Clifton and other lands around what became called Rocksavage. His mother was Katherine Stanley, sister of Thomas Stanley, 1st Earl of Derby, and his father John Savage (c. 1424–1495). Savage fought with the Yorkists at the Battle of Tewkesbury and became close to Edward IV, whom he served as royal carver and knight of the body. Edward appointed him constable of Hanley Castle, and he was a pallbearer at the king's funeral. Under Richard III, Savage and his father fell under suspicion but remained at liberty, John being made a freeman of Chester in 1484, when his father was mayor of the city. that sad men were at assay. After the battle, in which he commanded the left wing, he received extensive grants of land confiscated from Richard's supporters, including from John, Lord Zouche, and Francis, Lord Lovell. On 16 November 1488 he was appointed a Knight of the Garter. He was killed at the siege of Boulogne in October 1492. [S746] Wikipedia, online http://Wikipedia.com, https://en.wikipedia.org/wiki/John_Savage,_KG. Biography*: Amlaíb mac Sitric (c. 927 – 981; Old Norse: Óláfr Sigtryggsson), commonly called Amlaíb Cuarán, in Old Norse: Óláfr kváran, was a 10th-century Norse-Gael who was King of Northumbria and Dublin. His byname, cuarán, is usually translated as "sandal". His name appears in a variety of anglicized forms, including Olaf Cuaran and Olaf Sihtricson, particularly in relation to his short-lived rule in York. He was the last of the Uí Ímair to play a major part in the politics of the British Isles. Biography*: Jón Magnússon was Earl of Orkney in 1284–c. 1312. [S746] Wikipedia, online http://Wikipedia.com, https://en.wikipedia.org/wiki/J%C3%B3n_Magn%C3%BAsson,_Earl_of_Orkney. [S742] The Peerage, online thepeerage.com, https://en.wikipedia.org/wiki/Gilbert,_Earl_of_Orkney. Biography*: Rognvald Kale Kolsson (also known as St. Ronald or St. Ronald of Orkney) (c. 1103 - 1158) was an Earl of Orkney and a Norwegian saint. Rognvald's parents were lendmann Kol Kalisson and Gunnhild Erlendsdotter, the sister of Magnus Erlendsson. It was through his mother, Gunnhild that Rognvald had a claim on the Orkney earldom. Rognvald Kali Kolsson may have been born in Jæren, Norway. That is not most likely, since his family resided in Agder and Jæren is in Rogaland. Some researchers think that he may have been born in Fjære, a part of Grimstad. The kings estate at Lista is also estimated as birth- and childhood place. Rognvald's family owned several farms in Agder where the boy could have spent his childhood. King Sigurd I of Norway appointed him Earl of Orkney and Shetland in 1129. When he became Earl, Kali was given the name Rognvald, after Earl Rognvald Brusason, who Rognvald's mother Gunnhild thought of as the most able of all the Earls of Orkney. It was thought this name would bring Rognvald luck. Rognvald should have had one half of Orkney as his uncle Magnus Erlendsson had, but his second cousin Paul Haakonsson had just made himself sole ruler of the islands and would not cede any of them. Rognvald remained in Norway as one of the leading men of King Harald Gille. His father counseled him to make a vow that if he were successful in establishing himself in Orkney, he would build a church in honour of his murdered uncle Magnus. By sabotating some beacons on Fair Isle and in the Orkneys, Rognvald made a successful landing unopposed. Through the intervention of the bishop an agreement was reached with Earl Paul. Later earl Paul Haakonsson was captured by Sweyn Asleifsson and delivered to the safe-keeping of Maddad, Earl of Athole, who was married to Paul's sister Margaret. What then happened to Earl Paul is unknown. Rognvald was hailed as jarl in 1136. In 1137, Rognvald initiated the building of St. Magnus Cathedral in Kirkwall, Scotland. Rognvald also served as guardian to Harald Maddadsson, the five-year-old nephew of Paul Haakonsson. In 1138 Rognvald appointed Harald Maddadsson as Earl along with him. Harald had inherited Caithness, Scotland and thus was Rognvald master over this area. In 1151 Earl Rognvald set out on pilgrimage to the Holy Land. This celebrated enterprise takes up five complete chapters of Orkneyinga saga. The telling about their staying in the Holy Land is very short. It seems that the journey is the important part. But the description of the voyage is dominatet more by stories about fighting and feasting. 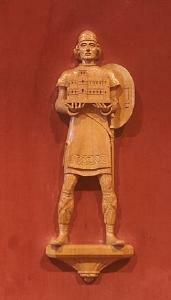 The saga tells that the impulse for the pilgrimage came from a distant relative of Rognvald, Eindridi Ungi. There mentions prestige as a motivation for taking this big scale expedition. The earl, with Bishop William and other well-born companions, including Erling Skakki, left Orkney in the late summer of 1151 in fifteen ships. The fleet sailed through the Strait of Gibraltar, after which Eindridi Ungi went straight to Jerusalem with six ships while Rognvald tarried in Narbonne. During his stay there he composed several verses—included in the saga—in honour of the lovely lady Ermingard, verses which show strong influence from courtly love poetry, possibly the first such examples in skaldic verse. Having visited Jerusalem, the party made its way back north via Constantinople, where they were received by the emperor and his Varangian Guard, then sailed to Apulia where they took horses for the journey to Rome, arriving back in Orkney for Christmas 1153. This evidences the wide-ranging role of the earls of Orkney as players on the world scene of twelfth-century Europe. They were now participating in the cultural and religious activities of Christian Europe rather than threatening them from the periphery. While he was abroad, King David I of Scotland granted half of Caithness to the cousin of Harald Maddadsson, Erlend Haraldsson. Earl Harald subsequently displaced Erlend Haraldsson, who was killed in 1156. In August 1158, Rognvald was cut down with his company of eight men by Thorbjorn Klerk, the former friend and counselor of Harald, who had been made an outlaw by Earl Rognvald for a murder committed in Kirkwall, following a series of acts of violence. His body was taken to Kirkwall and buried in St. Magnus Cathedral. Alleged miracles shall have happened at his grave as well as on the stone where he died. Ragnvald was canonized 1192 by Pope Celestine III. But some doubts exist as to the validity of his sainthood, because no existing records seem to confirm it. Although the perfume and onyx are George Mackay Brown’s own invention, it is true to the spirit of the poem: Praising the lady in luxurious terms based on 12th century European aesthetics, while also bragging about himself using war-like Norse aesthetics. Biography*: Paul Thorfinnsson (died after 1098) and Erlend Thorfinnsson (died after 1098) were brothers who ruled together as Earls of Orkney. Paul and Erlend Thorfinnsson were the sons of Thorfinn Sigurdsson and Ingibiorg Finnsdottir. Through Ingibiorg's father Finn Arnesson and his wife, the family was related to the Norwegian Kings Olav II and Harald II. Their lives and times are recounted in the Orkneyinga Saga. The first mention of the brothers is when they accompanied the Norwegian king Harald Hardrade and Tostig Godwinson on the ill-fated expedition to England in 1066. Paul and Erlend were with Harald's son Olaf Kyrre, guarding the ships, when the battle of Stamford Bridge was fought. Along with Olaf they were allowed to leave by the English king Harold Godwinson. Olaf overwintered on Orkney with them and left on good terms with the Thorfinssons. The Orkneyinga saga says that Paul and Erlend were on good terms until their children grew to adulthood, after which the disputes between their sons led to a quarrel and open hostility between the brothers. As the disputes between the descendants of Paul and Erlend loomed large in the affairs of 12th century Orkney, the saga goes into some detail on their family relationships. Paul was married to an unnamed daughter of Norwegian earl Hakon Ivarsson. Two sons and four daughters are named. Of these, Hakon Paulsson played the greatest part in events. Erlend married Thora, daughter of Sumarlidi Ospaksson, and they had two sons and two daughters, while Erlend had a third, illegitimate daughter as well. Erland's daughter Gunnhild was married to Kol Kalison and Rognvald Kali Kolsson was their son. Erlend's son Magnus Erlendsson appears in the saga as earl, martyr and saint. The troubles between the earls began with rivalry between Hakon Paulsson and Magnus's brother Erling Erlendsson. Both are described as talented but also quarrelsome and arrogant. In 1098, King Magnus III of Norway took possession of the islands, deposing of both Erlend and Paul. Paul's son, Haakon Paulsson, then became regent on behalf of the Norwegian prince, the future King Sigurd I of Norway, who made Haakon earl in 1105.